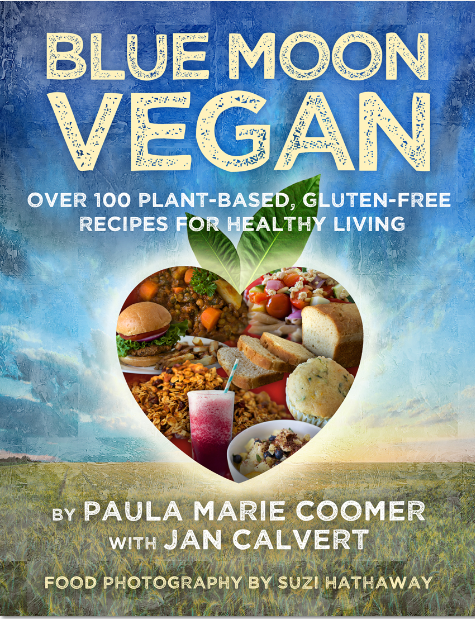 The time has finally arrived when I get to announce the release of my new cookbook Blue Moon Vegan! As you can imagine, everyone involved is so excited, from Phil and I to my gluten-free baking guru and collaborator Jan Calvert to my wonderfully talented photographer Suzi Hathaway of Suzi Hathaway Photography in Meridian, Idaho. Oh my gosh. What we had to go through to get the baked goods from Lewiston to Meridian for the photographing of that part of the book! Four vehicles, 340 miles, and a dozen people! We have all worked so hard, through baby births and crazy busy work schedules and holidays and summer heat and computer failures and software updates and on and on and on and on. I don’t think any of us will truly believe this book exists until we have it in our hands. But the proof will be here soon! Everyone everywhere will be able to walk into a favorite bookstore or hop online to buy a copy on Valentine’s Day! And all thanks once again to the great folks at Booktrope, the small Seattle press that is in the very active process of turning the world of book publication on its ear and which has so generously supported my authorly intentions. We will have a number of campaigns running these next few weeks as launch day approaches, and if you are in my area, please watch for an array of events in the upcoming weeks. If you are on Twitter and Facebook, watch for the words #LoveYourselfToo and #BlueMoonLove. Watch for announcements about book and gadget giveaways, virtual potlucks, photo ops, and free recipes not only from Blue Moon Vegan but from the ever-present creation rumblings in my and Phil’s kitchen. Wondering what else to do while you wait for February 14 to arrive? Well, I am so glad you mentioned it, because I am recruiting advance readers for Blue Moon Vegan. “Blue Moon Vegan Early Readers” is a limited, select and “secret” Facebook group for friends, family, and followers who are interested in previewing the book before it is available for purchase. Early Readers also are invited to participate in our FIRST Blue Moon Virtual Potluck. If you are interested in being added to this group—and we only have 15 slots left—please email me at coom1286@hotmail.com and like my page at Paula Marie Coomer/Author. And . . . keep checking back here! Recipes to come . . . and they are all about chocolate!